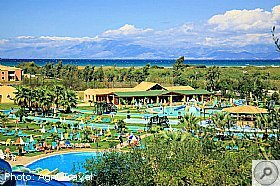 Acharavi is a busy and lively resort set on the North coast of Corfu, boasting something for everyone. It is not just a resort, it is the main town for the North of the island and many of the local people visit Acharavi on a regular basis as there is a post office, banks, a dentist and doctors and all the facilities found in a modern town. You will also find shops such as hardware stores and flower shops. Acharavi has plenty of Tavernas and bars, and a good, long, sandy beach. Behind the resort, set in the hills are excellent walking paths. These have recently been cleared and are part of the Corfu trail. The shops in the main town are situated either side of the main road which runs through Acharavi. Little streets run off this road down to the beach, where you will find many of the beach Tavernas and bars. Acharavi is a family resort offering everything from the sandy beach for young children and adults alike, to the night life that teenagers require. The re-opening of the Corfu trail in the hills behind and above the resort, has opened this resort up to walkers. The trail takes you through the shoreline and foothills of Acharavi. Lookout for the blue way markers. Acharavi was very popular with British holiday makers, but in recent years the British tour operators have receded. Some of the accommodation is now taken by Czechoslovakian and other independent operators. A sandy beach that stretches the length of Acharavi - about 3 km! There are sunbeds and umbrellas available for hire on the beach. There are showers on the beach, and the Taverna owners will let you use there toilets if you purchase a drink. Acharavi is a good beach for children, it is away from the road and the water is shallow. Afternoon sea breezes can pick up. Being that Acharavi is mainly on the flat the beach is very accessible. There is just a slight incline from the main road to get to the beach down the side roads. Acharavi is a clean beach and well looked after. There are no urchins. Follow the road through Acharavi and on the way out you will see signs to the Roman baths. They are situated just the other side of the town. Also a Doric temple remains near Roda which is the next town along from Acharavi. This temple is said to have probably been built as a dedication to Apollo. Follow the main coastal road from Kassiopi towards Acharavi. There are no turnings and this road is relatively wide compared to the roads around the Nissaki and Kalami area! Continue on this road past the Hydro Polis water park. Acharavi is the next town. Park on the side of the main road for shopping or turn to your right. down one of the many side streets that will take you to the beach. Limited parking is available next to the beach. 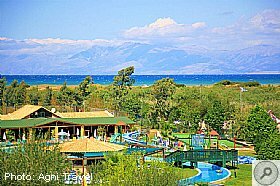 If you are looking for a fun day out with children or maybe just as a couple, water parks are always a good choice in the warm summer weather in corfu. 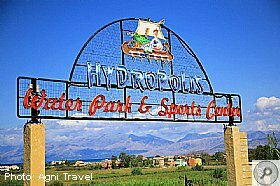 Here at Hydropolis you have a choice of fun water rides as well as sports facilities, such as tennis, beach volley ball, aquafit and water games. You can also learn how to scuba dive here. There is a small zoo with ducks, geese, ostriches, wild fowl, peacocks and rabbits. Children are made welcome and there are many child facilities, including a children's pool and water slide. The water park has four giant slides: The Toboggan which is 102m long! The Double Multi Run, the Hydro Tube and the 'Free Fall' for those who like a bit of fear !!!! Relax on the Lazy River Ride if all the excitement gets too much. For the more energetic there is a fully equipped outdoor gym, games of basketball and beach volley ball also take place. After all that exertion, you may want to relax in the ship like bar area with a cool drink, or have an ice cream or snack in the main centre of the park. If you fancy something more substantial, there is a self service restaurant serving Greek food. The Water Park is fully supervised at the pool areas by qualified staff. In case of accidents there is a first aid centre with trained personnel on hand. The water is cleaned to the I.S.O procedure, minimizing the need for too many chemicals. There is a tourist shop on site and also a photo shop. Lockers and safety deposit boxes are also available. So if you are looking for a fun filled day away from the beach try this water park. Prices: Adults 13 Euro, Children (5-12 years) 10 Euro, under 4 years Free. Transfers can be arranged. Call 26630 64700 for details. Follow the main coastal road from Corfu town through Ipsos into the North East of the island. The roads here are narrow and windy, mirrors are placed on the worst bends to help you. Pass Kassiopi, this is on your right, carry straight on following the signs to Acharavi. The roads start to widen and have less bends. As you near Acharavi you will see signs for the Hydropolis Water Park, there is plenty of warning. The water park is on your right the same side as the sea. Turn down through the main gates, follow the road down to a large car park at the bottom. There is a wide selection of tavernas. Many on the main road serving everything from a snack to a three course Greek meal. Or, why not try the Tavernas on the beach while watching the sunset. Taverna Maistro is an excellent place to sit and watch the sunset while enjoying a lovely meal and a glass of chilled Boutari or two!!! Acharavi has plenty of bars, throught out the town and going towards the beach. There are lively cocktail bars showing the latest films and sporting events, or quieter bars on the beach - for that all important aperitif before going to one of the local Tavernas. Acharavi has a water sports centre offering water skiing and ringo rides, also for parasailing (from the back of a ski boat). This is situated on the left hand side of the beach. It is possible to hire small motor boats in Acharavi. The main offices on the road have details of these. Also there is boat rental on the beach towards the left hand side. There are many shops here, Acharavi has most shops you could want on your holiday. The local people shop here so the choice is good, everything from the tourist shops and travel agents to the small individual gift stores if you are looking for something different to take home. There are many in Acharavi itself and also a couple on the outskirts of the town. The larger ones tend to be on the main road and smaller mini markets and tourist shops are on the side roads towards the beach. There are several banks and cash machines on the main road of Acharavi. There are also many places to exchange money in the resort of Acharavi. The tourist type shops will also change travellers cheques and foreign currency for you. The pool bars in Acharavi are open to the public. These are free to use but you will be expected to purchase a couple of drinks/snacks from the bar during the day. These swimming pools are mostly situated on the side roads just off the main street. There are public pay phones on the main road and also on the beach. These are the card phone type and you can purchase a card from the main supermarkets in the town. There are not only post boxes in Acharavi but also a main post office. So if you need to send a package or an urgent letter here is the place to do it. The post office is on the left hand side of main road coming from the Kassoipi side, inside the supermarket. Look for the Yellow Post Box with the Horn, outside. There is a play area and park just off the main road in Acharavi this is at the beginning of the centre. Acharavi town is very flat there are no hills to the shops and most of them are level with the pavement. Although be aware that the kerbs are quite deep. Acharavi, has an English resident mobile hairdresser. Jackie trained in London and has worked with many of the major hair stylists. Her skills include all aspects of hair-styling, including colour and highlights, children's and gentlemen's hair. On Corfu, Jackie is responsible for the North of Corfu's hairdressing for a major tour operator's wedding parties. This is organised through a wedding co-coordinator for the tour operator. Many of the holiday representatives (working for all tour operators) look to Jackie for their hairdressing requirements. Whilst here you can contact Jackie for an appointment on 69450 72511. Treat yourself whilst on your holiday ! This page focused on: Acharavi Corfu. For related information, please visit our Corfu Resorts Guide page. In CorfΓΉ, as in the rest of Greece, the name day is more important than the birthday. We will be back in Acharavi around the same time this year, not long now.. I tried asking our accommodation people there but they don't know when the festival will be on. Has anyone heard what the date is? I could do with knowing as I am trying to set dates for other things and don't want to miss this event either. Hi all, just had our first week here in Kassiopi weather is great and Kassi is as beautiful as always. We would like to drive up to Sunset Taverna for a meal and watch the sunset, we know we have to drive to Acharavi but not sure were to turn off main street to get up there, just wondered if anyone can help please? Does anybody know of a good reliable gardener in or near Acharavi please? For a complex of six apartments with a sprinkler system, many thanks Richard. We rent out an apartment in Acharavi all year round and get out whenever we can. We also have friends who have made the move permanently but rent in case they ever feel they need to return to the UK. The winter's in Corfu are soooo different to the Summer that I would recommend anyone thinking of moving over there to rent at first and spend at least a few weeks of the rainy season over there. Also, get good expert advice. It can be a minefield moving/buying in Corfu. I'm sure he will try lots restaurants in Acharavi too ...thanks will pass that on. Has anyone visited this exclusive looking place in Acharavi only my son has just booked a week here in July?? Any of you early travelers been to Acharavi this year and anything new since last summer? Morning. You will definitely be able to do day trips from Corfu Town all over the island, and will be able to go over to Paxos and Parga is you wish (even Albania). Long days but usually worth it. Personally, I love the North of the island. We are based in Acharavi whilst over there, but if you wanted just a couple of nights in a bay then a place like Kassiopi would suit I believe. 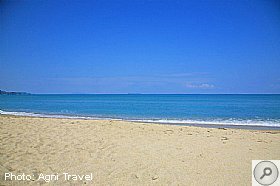 Kefalonia 13th May to 27th May. Acharavi 23rd September, 2 weeks, a few day trips to Kassiopi of course. Last year we came back from an evening out to catch the tail-end of a big festival going on in the Acharavi town square (behind the high street), there was live music and lots of food vendors, many people sat out, looked wonderful but we missed it. Not sure the exact date but it was around the 10th'ish, makes think maybe St. Spyridonβs Day? Does anyone know for sure if the same is scheduled for 2018 and what date? We don't wan't to miss it this year. Thanks for the tips. Another couple to try in October. I also love Alegria in Acharavi. Meze tavern that works really well if in a group. Thanks for that post ... makes interesting reading, although I am sure many will disagree with some of the comments! It was excellent timing as my daughter and her family arrive in Acharavi late tonight and good to know 'Filaraki Taverna' opens till 1.30am, but I expect others will too. What's on in Acharavi in September? Heading to Acharavi in September later than usual for us - just wondering if there are any changes or anything new in Acharavi? Has the rubbish collection situation improved any? Our family are staying in Acharavi in August and it was really bad when we were there in June. Just read Mandy Baggot's book about Halloumi. Can't wait to visit Lavender. Excited. Had a trip to Acharavi from Kalami yesterday but Lavender was closed. Will try another day as website says it is open tomorrow. 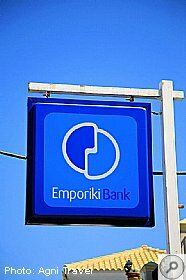 My daughter and her family are having a change from Kassiopi this year and staying at the Eriva Apartments in Acharavi. Good reviews and their website is good. Anyone know it? Maistro on the sea front in Acharavi have bouzouki players some nights, as do Alegria and Ta Rebetika also in Acharavi. Also The Family restaurant in Sidari. Basically you need to check out local postings or The Corfu Grapevine on facebook where they tend to be advertised. Ditto! stayed in Kassi many times, but last summer ended up in Acharavi, at Matoula. We liked it a lot, being so near a decent beach and for the same money Matoula's accomodation was so much nicer and more spacious (2 bedroom apartment) than Kassiopi's. We did miss the charm of Kassiopi village, Acharavi is a bit frenetic during the day being either side the main road, but in the evening felt very different, relaxed, many places to eat, live music, really good. Hired a car for a few days so easy to visit Kassi a few times. We will be back at Matoula in August this year, and bringing friends too! - counting the days. And you cannot go anywhere by bus from St Spyridon, it is a long hot walk from the main road. Mare Blue might have a courtesy bus, someone else may know. We stayed in Acharavi for the first time last September after many holidays in Kassiopi. I loved it and hope to go back this September. We stayed at Matoula, self catering but we ate out most of the time. So many wonderful bars and tavernas to visit in the area of Acharavi. Sorry, you are, of course, free to do whatever you like. Thank you both, we usually stay in Kassiopi but thought we might try either St Spyridon or Acharavi go all inclusive. Really not sure what to do!! Hi all, could anyone please tell me if you can walk from Acharavi to Kassiopi? Topic: Marriage In Corfu Advice Please! Does anyone know if it is possible to get married on Acharavi beach as opposed to the town hall? Any help much appreciated. View Topic: Marriage In Corfu Advice Please! Rosey and I got married on 22nd September this year in Kassiopi Town Hall. I had intended to do all the paperwork myself but after pricing it all up I realised it was not much more to get a wedding planner to do it. We contacted Lorraine Young at Corfu wedding Planners as she has a home in Kassiopi but she was fully boooked for that month BUT despite this, she did go to the town hall and book us a time and then she would not take any money for doing it. The reason for that date is because we had already booked our holiday for 12th to 26th and you have to be on the island 9 days before the wedding. That, coupled with the fact they only conduct weddings on a Thursday, gave us our date. I then contacted Andreas at Ionian Weddings and he arranged everything else for us and sent his agent from Corfu Town for a pre wedding meeting and on the day as well and she was great. There was a slight hiccup on the day when the registrar was involved in a car accident in Acharavi on her way to us but she did arrive an hour later and was completely unhurt and the ceremony was so chilled, it was excellent. Panos and Debbie from Apollon apartments took us to the town hall in their suitably decorated car and gave us champagne afterwards and would not take a penny even though we were not even staying with them this year! The reception was at The Old Schoolhouse (3 Brothers) and a fantastic meal for 8 of us along with champagne. All drinks and a wedding cake only came to 100 euros! No wonder its our favourite restaurant. The whole village helped us celebrate and it was a fantastic day (& night) to remember. At the end of the night we recieved the sad news that Yiannis Boutikos (whose wife runs the ice cream shop near the harbour) had passed away that morning but everyone kept the fact hidden from us so as not to spoil our day. That is the sort of thing that makes Kassiopi folk so special. If anyone want to get married at the Town Hall better be quick as its closing in the near future and being converted into a High school! Will be in Acharavi for the first time next month, how far is it to walk to St Spyridon and the lagoon? 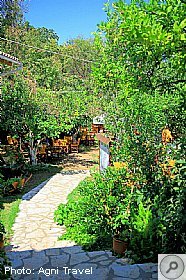 Returned from Acharavi middle of July, during our last couple of days a new taverna/salsa type bar opened near to the Lemon Garden. Is it still up and running ? We called in a couple of nights, had a lovely atmosphere. 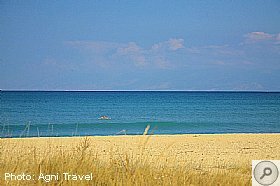 Fly out Friday for 3 wonderful weeks in Acharavi with a cheeky 3 nights in Messonghi. Can't wait to see friends, relax, and enjoy some quality food and a tipple or two. Here's hoping my daughter doesn't break her foot this year! To answer my own questions now we have returned - lovely villa but essential to have a car -the road is positively dangerous to walk along into Acharavi- and in the heat, it was too far to carry shopping anyway. Saw a head on collision between a car and a quad bike on a bend -the quad was on the wrong side of the road -God help any pedestrians who had been about!! Water park is certainly no longer "good value" -many rides out of order and the ones that were open were, in our view, not safe -seemed to be only one attendant on the highest ride -no one ensuing the pool was clear below and finally the infants toys were in terrible state with broken sharp bits of plastic sticking out. Should be closed IMMEDIATELY - our H & S would have a field day!!! Used Carrental for car hire - got a good deal - also he organised the best mini coach for our return to the airport -one of the luxury mini coaches beloved of football teams. Hydropolis is just outside Acharavi and is fairly big, although not as big as Aqualand. Sidari Waterpark is quite small and I would say more suitable for younger kids. Google it and you'll see the photo's. My friend's grandson (10) loved it. I believe you can buy a daily or weekly pass and it's not too expensive. Good luck. Topic: Anything New For 2016? Any further updates on Acharavi? Anything new opening or happening. We arrive 27th June. View Topic: Anything New For 2016? I've ridden a 125cc quad with my teenage daughter on the back for the last four years around the North of Corfu. Based in Acharavi, we've been to Kassiopi (day & night), Paleokastritsa, Arillias, Old Perithia, Pantokrator, Ag Georgis, Angelokastro and many other places. Learn how the quad reacts at speed (30 mph in reality) and how and when to brake. Yes, I've been fortunate, no accidents and not seen a quad accident but I've also seen quite a few car accidents as well whilst on Corfu that had nothing to do with quads. Absolutely massive thing to take into consideration, standard holiday insurance will not cover you if you have an accident on a quad. Do what you feel best with but always stay safe. Nice surprise my son just told me himself wife and my 3 grandchildren will be joining me and the wife in Acharavi end of June for 2 weeks. Got back on Friday morning from our mini break. We were very lucky with weather (I even burned my arms and leg sat on Acharavi beach on Wednesday). We found Nymfes waterfalls, visited San Stefanos (beach needs sorting there), Kassiopi (lovely coffee sat in Wave Bar), and found Binilikia up in the hills. We had lovely food everywhere we went β Binilikia, 3 Brothers at Astakeria, Grill room, Woodys and Foros all in Acharavi. I have to say that we had a really relaxing time (helped with the kids being at home)! Canβt wait to go back in August! View Topic: Booked For May! It takes 15-20minutes to drive there, so that would give you an idea. In the other direction you can walk across the beach round the headland then walk along Almyros beach to Acharavi. We are staying in a villa near Acharavi end of June. We have finally managed to confirm a booking of a minibus on arrival (6 adults plus 4 kids less than 5) despite the taxi firm wanting a more precise address than we could get - but, because we will have to be out of the villa more than 12 hours before our flight, we couldn't confirm a return as we didn't know where the pick up would be!!! How easy will it be to organise locally, once we have worked out where we will spend our final day?? There is a nursery before you get to Acharavi on the right hand side, that sell flowering plants, they will gift wrap for you. There used to be one going south from Kassiopi, but not sure if it's still there. There is a flower shop in Acharavi on the right hand side about half way through the town. Think 49100 is the old postcode possibly for the whole of Corfu. The current postcode for Acharavi/Almyros is 49081. They are being a little pedantic as many places in Corfu do not have a Street/Road address. Your not on the Acharavi site. As this particular thread has gone off track a bit, I'll try and sort it out for you. 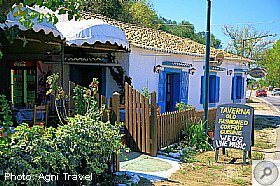 Zephyros taverna is not located in San Stephanos, but is in Almyros between San Spiridon and Acharavi. Coming from Kassiopi direction, after the Perithia turn off, about 1km further on you pass a little taverna on the left Han side of the road (Mythos taverna) take the next right turn by the old council yard, just follow the road and Zephyros is at the cross roads. Check Sarah Acharavi post out. Any new tavernas going to be open in Acharavi? There is a small mini market on the main road nearby. 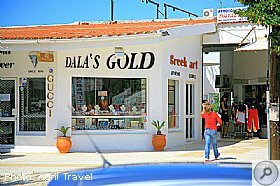 At the entrance of Acharavi is Dielas Supermarket containing all the usual as well as fresh fruit and veg and a butchery. On the opposite side of the main road is an independent butchers shop. At that end of town are car hire outlets, post office, ATMs etc. A bit further into town you have another smaller supermarket Tavros, Alpha Bank, a couple of bars and grill rooms, and not to forget Castaway Travel office for trip information. Don't try to plan too much in advance, enjoy the exploring. Thanks for replies - actually used the Street View function on Google Earth and it appears that there are a couple of supermarkets just after entering Acharavi proper - this is ~ 1 mile from villa - so just about walkable in the morning before it gets hot, provided that they are still there!! Are there any closer in the opposite direction?? Or down by the beach road?? Is there a local map that shows the location of restaurants/tavernas? We were in St Georges South a couple of years ago and there was a really good small scale map. Good to know about the waterpark as we will have a 2 year old and two at ~ 20 months. Top Notch food and good prices. That's my opinion. Knowing you are a Acharavi Man I would advise you to book a table, as it's hard to just walk in, if you do you are lucky. Have a great time. Here are the answers i have of the Quiz. Booked our flight before Christmas arriving April 9th for our long Summer idyll. Have not booked a return we will decide later in the Summer. If anyone is there say hello to Acharavi for us. Going to our place in Acharavi for 3 weeks on 12th August with 3 nights in Messonghi booked too. Te he Thanks for this! It is because of this programme that Lynn and I eventually (see below) made it to Corfu! Way before this (1979) Lynn's parents and two younger sisters went to Paxos (staying in Gaios - incidentally, it turns out that a close friend who now runs a travel agency in Acharavi was their rep at the time!). Subsequently, the middle sister was offered a job at the Paxos Beach Hotel for the 1980 season. This being the case, Lynn and I planned to visit overland on the motorbike, which is very much how we holidayed at the time. Unfortunately, the sister decided not to take up the job and we made alternative plans. Move on to 1985 and we watched this episode of Treasure Hunt and decided that we would break with tradition and go on a "package holiday" renting a villa in Acharavi with Grecian (remember them?). The rest, as they say, is history; we have only missed two years since, but have many visits each year and now have a tiny cottage in Porta. 1. 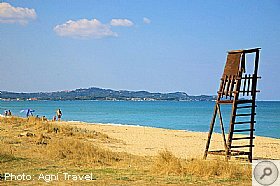 Which tavernas/bars are a must visit in Messonghi/the surrounding area? 2. Which places/beaches are a must see whilst there? around the South of the Island is no problem. All recommendations are much appreciated. The tsipouro we had at Alegria in Acharavi was warmed, with orange peel, honey and cinnamon (can't remember any other ingredients Lol). It was then sieved. Tastes lovely but is lethal. Close to rakamelo but that has cloves, not sure if the rakamelo we had did. Need to write the recipedown next time Aaron tells me. I do the same Kinninviekid. 3000 bought in Acharavi just over a week ago - β¬600 so gives me a saving of around β¬1200 on UK prices which is Β£900. It really does highlight how much tax we must be paying in the UK. Son and his girlfriend in Acharavi right now, they've both been using the Lifesystems stuff and have not as yet had a bite. Been back since early July but son flies out next Monday, what's the mossie situation like at the moment plus any changes in Acharavi? Thanks. Personally, I'm not worried. Our friends in Acharavi say all is good. However, I can see it putting a few potential tourists off when Greece needs all the help it can get. When will Greece see the light at the end of the tunnel? A more respectable view on the happenings in Corfu. Really, folks there are no problems here on the ground. Maybe worth bringing more Euros into Corfu but the ATM's are still working. Got money out tonight on a UK card in Acharavi as that was were we there at the time. If anyone is looking for light holiday reading, I can recommend Truly, Madly, Greekly by Mandy Baggot. Set in an AI hotel in Ag Spiridon near Acharavi, it's a classic tale of a holiday romance with a few laughs and some familiar places added in. Barrie, whereabouts in Northumberland are you from? My in laws, who have a place in Acharavi, are from Prudhoe. Mad on Newcastle Utd too (oh well, we can't all be perfect)! Back from Acharavi yesterday, no need to worry about the news scare mongering. It was business as usual and as welcoming as ever - enjoy! THE EURO we are coming over to Acharavi on Sunday, is things still OK? My wifeis just concerned about the state of the euro. As long as we get there am OK. I think we might make a few ventures over the other side as we should really, I like the mountain drives but the family moan it makes them sick, especially the hairpin roads up to Pantokrator - Oh for something small and sporty to whizz up there! Hire an automatic, it makes the drive so much easier on those narrow roads. We had a Golf from Travel Corner which was good on fuel (20 euro got us all over the Northern end down to Paleo and back) well worth the extra few euro to hire to avoid all those gear changes with enough 'grunt' to overtake when you need to. As for another beach, try Acharavi. The beach is several miles long and the water waist deep for quite a way out. Hi Everyone...hoping someone can help us out please. Now that Monarch no long fly to Corfu, the flight times have changed and we need to leave the villa hours before our flight, although we booked with Cosmos (never again), they have just advised to 'ask around for luggage storage, when we get there'...do you know of any where in Acharavi that provides this facility? We are soooooo looking forward to arriving on Monday - 6 sleeps wooooo hooooo ... many thanks in advance. Will the music night at Ta Rembekika be a regular occurrence? Also, have any other music/Greek nights popped up in or around Acharavi? We really enjoyed the one at Binilikia last year and so disappointed it's closed. What dates you going? We are there on Sunday (Acharavi ) 28th not staying in Matoula but could meet up for a night cap somewhere on the Main Street if interested. 28th of June be back at my favourite place Acharavi. As mentioned above arriving in Acharavi on June 26th Sunday have 2 questions : 1. what's the mossie situation - wife prone to terrible bites. 2. Arriving on a Sunday will the Diellias market on the high street be open for basic provisions? I use a N&P card and have used Alpha, see below. Agree with previous comments, Woody's on the beach is great with Akis and Rena superb hosts. I can also recommend Acharavi Park on the main road. Food is delicious and service great. Have a great holiday. Not quite a festival, but a music night. Just heard that Rembekika Taverna in Acharavi had a music night last evening, which included our friend Alexis Glikiotis, good to see him back on the island. I'll endeavour to find out if it's going to be every week, and post on here. I believe you just need you passport to register a Greek sim card. That's what I did earlier this year at Germanos in Acharavi. To repeat myself from a general post. There is to be a Traditional Greek dancing display in Acharavi on this coming Sunday 31st May, starts at 8 o'clock, if like other years, there will be food and drink to buy. The location is the Town Hall Square. Which is sort of opposite The Lemon Garden, just up from The Pumphouse. Just seen posters advertising a Greek Dance display in the council office square in Acharavi, this Sunday 31st May. With many groups performing. Usually there is food and drink available at these does. There is going to be a village festival (Panigeri) at Agios Martinos, on Wednesday 20th May. The village is the first one up from Acharavi on the Pantokrator road. The following day, there is another festival in Nimfes, also up from Acharavi but the other end of town. Also the 21st May is the name day of all Costas and Konstantinas etc, just say Hronia Pola. Were is Tete a Tete please? to try a few more bars this year. Might even re-visit when we first started going to Acharavi and give Harry's bar a try. Used to have some fun nights in there! Is there a bus that goes up the east coast which you can get on at Kalami? How far does it go? Just thinking if we could hop on and go to Kassiopi/Acharavi etc? 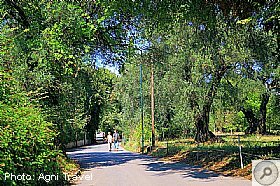 Petalia is on the road up to Pantocrator, it is one of the highest villages on Corfu. About 20minutes up from Acharavi. Where is Petalia in relation to Acharavi please? Also, surprised the Central Bar has changed hands as thought it was doing well. Anyway, if you hear of any Greek nights being held in Acharavi then please let us know. It was great at Binelikia last year. Such a shame it has closed. Been raining all day here in Corfu until about 2.30pm. Hence the Independence Day parade scheduled for 11am ish in Acharavi was cancelled. Currently 18C and sunny. What's on in Acharavi at end of June beginning of July? Back to Pelekas June. Love this place just me and wife 2 days only we stop in Acharavi for rest of holidays. This page was generated in 5.953 seconds.